Alberto Contador is a retired pro cyclist and one of an elite group that have won all three Grand Tours: the Tour de France, Giro d’Italia and Vuelta a España, and consequently is ranked as among the current world’s best three-week stage racers alongside Chris Froome, Vincenzo Nibali and Nairo Quintana. His strengths lay in his climbing ability, strong performances in time trials and tactical nous – the perfect combination for a stage racer. The Spaniard has won two editions of the Tour de France (2007, 2009), two Giro d’Italia victories (2008, 2015) and three wins in his home tour, the Vuelta a España (2008, 2012 and 2014). He can also count victories in some of the biggest week-long stage races among his impressive palmares: including Paris-Nice, Tirreno-Adriatico and the Tour of the Basque Country. 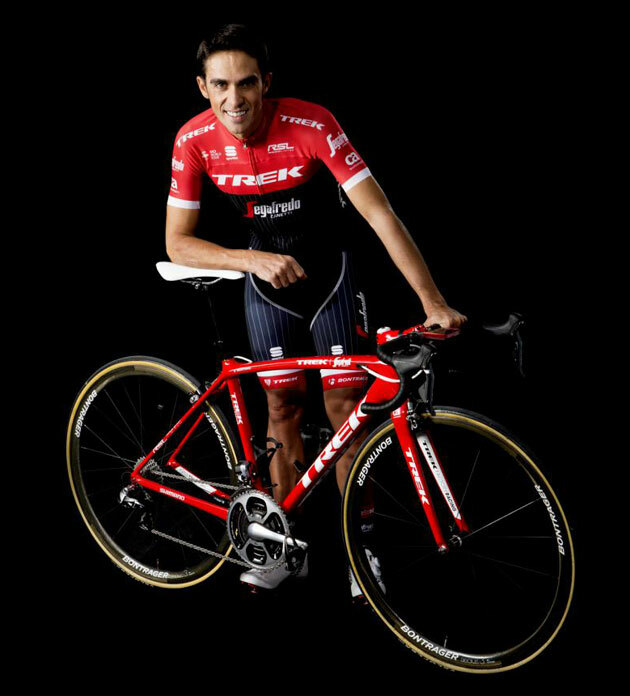 Contador continued to ride into 2017, despite earlier stating that he would retire at the end of the 2016 season, with the Trek-Segafredo team. He did, however, retire at the end of 2017 – having taken ninth in the General Classification of his last Tour de France. A shadow was cast over Contador’s career during the 2010 Tour de France when he tested positive for clenbuterol. He maintained his innocence, but a protracted anti-doping case ultimately saw the Spaniard stripped of the 2010 Tour and 2011 Giro titles, and all other race wins from July 2010 to February 2012. Alberto Contador has been touted as the most talented stage racer and all-round talent of his generation. In four years, the Spaniard won five Grand Tours – including three Tours de France – a remarkable achievement for such a young rider. Contador is only the fifth rider in history – and the first Spaniard – to have won all three major Tours. Contador is best known as a climber, with victories on the Angliru in Spain and Plateau de Beille in France in his palmarès. Contador’s win in the 2007 Tour came after Dane Michael Rasmussen was kicked out of the event. The Spaniard handled the pressure of leading a major Tour for the first time in his career and fended off Australian Cadel Evans in the final time trial for the overall win. Barred from racing the Tour in 2008 because of the 2007 scandals in Astana – before he joined the squad – Contador’s victory in the Giro came despite virtually no pre-race training and a last-minute warning he would be racing. His win in the Vuelta a España that year was more widely expected, but confirmed him as the strongest three-week stage racer in the world. Contador remained with Astana in 2009, where he had Lance Armstrong as a teammate. The relationship between the two riders came to a head during the 2009 Tour de France, where Contador felt he was isolated by a team rallying behind the Texan. Yet he still managed to win the Tour for a second time in the face of overwhelming pressure and internal fraction. In 2010, Contador was undisputed leader of his Astana team at the Tour after Armstrong’s departure to RadioShack. Contador clinched his third overall Tour victory despite not winning a stage and being challenged closely by Andy Schleck (Saxo Bank). A week after Contador won the 2010 Tour with Astana, he announced that he would be leaving the team. Bjarne Riis then confirmed in early August that he had signed Contador to the Saxo Bank team for the 2011 season. In September 2010 news broke that Contador had been provisionally suspended from competition for failing a test for clenbuterol during the Tour de France. He was cleared by the Spanish cycling federation in February 2011 and promptly won the Tour of Murcia after taking two stages. On Monday, February 6 2012, the Court of Arbitration for Sport handed Contador a back-dated two-year ban for testing positive for clenbuterol which expired on August 5, 2012. Contador came back from his ban to win the 2012 Vuelta a España overall, followed by a win in Milan-Turin. A relatively quiet year in 2013 was followed by a season in which Contador returned to peak form. Despite being forced to withdraw from the 2014 Tour de France due to crash injuries, Contador made a remarkable recovery to take control in the Vuelta a España, beating Chris Froome to victory. He followed that up with overall victory in the 2015 Giro d’Italia, officially his second title after having his 2011 victory annulled due to his doping ban. That victory was a part of an ambitious double by Contador, who aimed to be the first rider since Marco Pantani in 1998 to win the Giro and Tour in the same year. Things didn’t quite pan out though, with Contador looking well off the pace as Froome soared to his second victory at the Tour. Before the start of the 2016, Contador had already stated his intention to retire at the end of the season, with one last crack at the Tour de France on the cards. Some excellent form seemed to counter his mindset though, with second placed finishes at the Volta a Ciclista a Catalunya and Paris-Nice before an overall victory at the Tour of the Basque Country. Contador then implied that he would consider going on racing for another year. 2017 saw El Pistolero riding for Trek-Segafredo after Tinkoff called it a day. The Spaniard took a super conservative approach to his Tour de France preparation producing no wins but several second place finishes at Paris-Nice, Volta a Catalunya and Tour of the Basque Country. Finishing outside the top 10 at this year’s Critérium du Dauphiné (11th) led to people questioning his physical form for a three week tour like the Tour de France. However, you can never write off the future hall of fame cyclist. Alberto Contador says that he is still angry about the doping ban for clenbuterol which saw him stripped of the 2010 Tour de France and 2011 Giro d'Italia. Should power meters be banned from pro racing?